EPITRAN COST Action CA16120 aims at building a synergistic network of researchers actively working on all aspects of epitranscriptomics, thus assembling a critical mass to effectively address the key questions and compete with non-European groups in the field. Extensive collaboration on these questions will foster the creation of a high-impact European research hub on epitranscriptomics, able to drive discovery and indicate future avenues to be pursued. Furthermore, the Action will aid the incorporation of the European biomedical industry in this process, facilitating the translation of discoveries into applications for health-improvement. Action’s position paper(s) describing the state of the art and detailing key issues related to epitranscriptomics. A platform for joint grant applications that will increase collaboration within the Action and yield stronger, more successful grant applications both for national and EU funding schemes. Annual short-time workshops to share results, identify new collaborations and strengthen networking between the participants. Annual think-tank meetings between academics’ and biotech companies’ representatives to constitute a European Epitranscriptomics Observatory. Short Term Scientific Missions (STMSs) to promote the exchange of complementary expertises of young scientists in collaborating participant laboratories. University-level short courses for MSc students at some of the university locations of the network, to familiarize them with the results and the concepts of epitranscriptomics and stimulate their future research interested in the field. Advanced and practical courses for early-stage researchers to acquire working knowledge of experimental and computational approaches to the study of epitranscriptomics. A dedicated big data platform consisting of a database specialized for epitranscriptomics datasets. provide adequate outreach to the larger European research community and to the public about possibilities and limitations of research on the epitranscriptome. The EPITRAN Action will be implemented through 5 Working Groups (WGs), 4 of which focus on the different approaches to developing epitranscriptomics research and on promoting its links with medicine and business. While WG1 and WG3 will assess and explore the mechanisms of epitranscriptomics and their role in disease onset and progression, WG2 will provide a core computational and methodological layer for hypothesis generation, data analysis streamlining and analytical protocols. WG4 tackles the translation of knowledge to industrial application in biomarker and drug development through active dissemination and exploitation actions. A fifth, transversal WG5 will provide extensive training opportunities and tools to the Action participants. The objectives and tasks of each working group combine the various skills and expertises of the participants, by maximizing the coherence of each group while promoting interdisciplinarity through the tight connections between them. 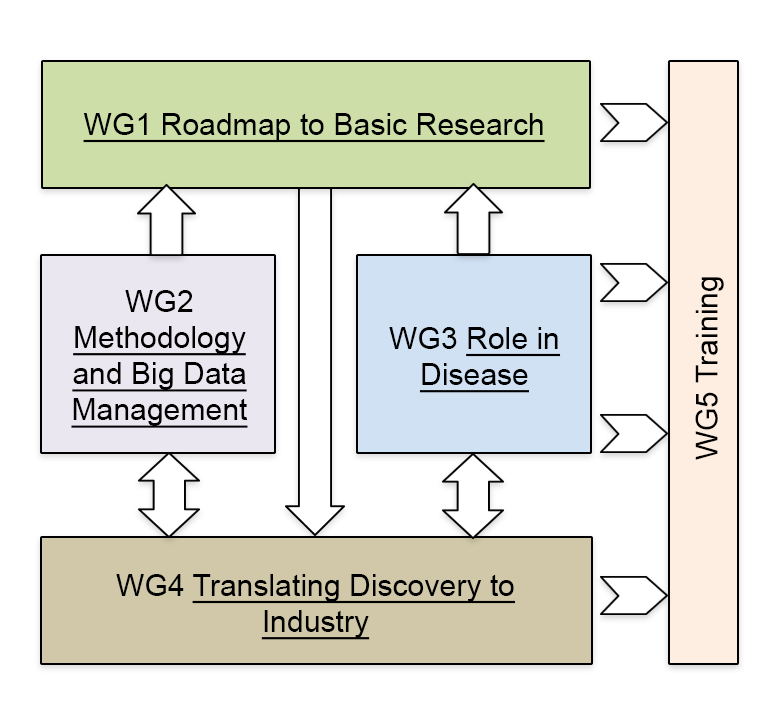 WG1 will undertake the specific task of building a European observatory on the topics addressed worldwide by epitranscriptomics researchers, especially in the currently leading countries, US and China, and to develop internal recommendations to identify a European roadmap to basic research in epitranscriptomics. The overall aim of the group is to review epitranscriptomics research and national funding policies during the course of the Action, collecting and coordinating inputs by the other WGs, and to propose internal guidelines for the development of research, technologies and funding strategies. WG2 aims at promoting and facilitating the discovery of epitranscriptomics mechanisms by focusing on the identification of methodological problems in experimental and computational biology techniques applied in the field. This WG will also deal with the important issue of the massive amounts of data that will be produced by epitranscriptomics. The big-data layer is fundamental for the success of the topic, requiring special attention. Recommendations will be provided to obtain versatile and optimized tools for studying epitranscriptomics. WG3 will explore alterations in the epitranscriptome in the onset and progression of complex diseases that affect global health such as cancer, diabetes, and neurodegenerative disorders, in addition to infectious diseases, providing novel drug targets. RNA modifications and associated regulatory factors are potentially involved in pathological states. Alterations in RNA methylation patterns suggest the possible development of novel biomarkers and of a novel class of targeted drugs. The network will share preliminary data to unravel the role of epitranscriptome in diseases. Bridging the academic environment with the biomedical industry, this working group plans to accelerate the translation of knowledge gained by WG2 and WG3 into biomedical applications aimed at the improvement of human health. In particular, with the collaboration of biomedical SMEs, the workgroup will establish collaborations aimed at identifying potentially novel biomarkers and molecular hits that modulate RNA modifications. These will be tested as perspective leads in drug discovery programs for human pathologies in which alterations of the epitranscriptome have been implicated. WG4 will implement EPITRAN exploitation plan. This working group is an horizontal platform for the Action, that aims at organizing and coordinating training initiatives within the Action. Given the novelty of epitranscriptomics it is particularly important to offer extensive training opportunities to the participants and to the broad European research community. This fundamental task thus deserves a dedicated working group. Its activities will be implemented by interacting with the other working groups.